Early one morning, I was texting with a foster mom friend. The conversation had begun the previous night but then I crashed at 9:00, which my husband and I are apt to do these days, and we picked it back up that morning before 6:00, before any of our cumulative six kids woke up, before our day took a turn for the crazy. These were wacky days for her and for us, for very different reasons, so we took a moment to lean into a safe place of camaraderie and trust, compare notes, build up, say things that in a different context might sound selfish or absurd. At one point in the conversation I thought "Maybe she is a crazy person for taking this on." And then I remembered of course that I myself had done the exact same thing, just on a different timeline. So I guess we can be loony together at least. But seriously. Foster parents or people who feel inclined to pursue foster care are pretty much crazy people. To fling open your arms and your doors to welcome someone else's kids and care for them like, or alongside, your own. To submit your schedule to a rigorous overhaul in order to accommodate the revolving door of people in your home, appointments to go to, services to set up. To take on the condescending, or at best confused, looks of strangers who don't understand why your family looks like it does. To lose a bit of sanity and a lot of sleep. I proceeded to contemplate what might be a common tie between all the foster parents out there, or even just the ones I know. A positive tie, not a sorta negative one like "we're all crazy". Something came to mind. Foster parents don't have bubbles. Well, I'm sure foster parents have lots of actual, physical bubbles. In my experience, they always end up dumped out onto the driveway and the promise of a few minutes of engaged, happy children is found dripping slowly down the slight slope. Not those kind of bubbles. I mean the kind of bubble that ropes you in to a personal safe zone or comfort zone that you choose, consciously or unconsciously, not to venture out of. Maybe it's a religion. Maybe it's an area of town. Maybe it's an area outside of town. Maybe it's a type of people. Maybe it's an economic status or level of income. Maybe it's independence, comfort, flexibility. Name your bubble, the thing that ropes you in and limits the reach of what you can do for this world. Foster parents don't have them, and if they do, they end up popped or dripping down the driveway pretty darn quick. Foster parents open up their home, their income, their hearts and minds to who-in-the-heck-knows-what. They welcome kids who don't look like them, act like them, live like them. They have to operate based on someone else's set of rules, not their own. They have to give up flexibility and predictability. They have to extend themselves beyond the typical bubbles a lot of folks set up around themselves in our society today. And yet, there is one type of bubble that nearly every foster parent out there will admit they've been stuck in. It's not a fun bubble either. It's a bubble of isolation and misunderstanding, where you feel like you're on an island, and where you wonder if you have made a lunatic decision that will distance you from all the people in your life not on the same path. You find yourself scratching around for camaraderie and understanding. When you find it, you hold onto it and hope it sticks. If you're lucky, you end up with a safe space where you can communicate openly and honestly. Where you can be selfish if you need to and be consoling if you're asked to. Where you can let swear words fly because you know they'll just bounce off the inside of the bubble and not reach anyone but the person hanging out in there with you, who merely nods in agreement and may contribute a few themselves. It's text conversations at a time of the morning when a lot of the world is still asleep. It's "How are you holding up?" and "You'll never believe the latest court decision" and "What can I do for you in this moment?" It's "I'm here for you" and "Let's do this." It's two steps forward, one step back. It's daily struggle and success with lifelong impact. When we officially adopted our three kids back in May, our family turned a corner into a new normal, one without CPS oversight and one with a whole lot less in our schedule. No more social worker visits or attorney visits or inspections or court hearings. No more medicine logs or doctor appointment paperwork. Suddenly, following a few words said by a judge, we were a regular, normal family. We began to settle into that and it began to sink in. 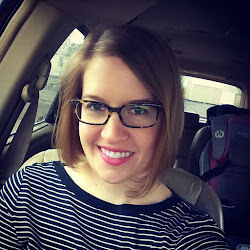 I went through a phase of not blogging because I felt like suddenly we were so normal I didn't have much to write about in this foster care and adoption realm. But normal is relative, maybe surface level, maybe based on appearance. I began to think through experiences I was having while parenting my children and found myself thinking things like "Normal families don't have to deal with this and that" or "A normal mom wouldn't feel the need to think through that particular thought process." I was becoming aware of the fact that, though our family may appear normal now and be afforded all the privacy and perks of any legal family in our state, we will never be the same kind of normal as non-adoptive families. 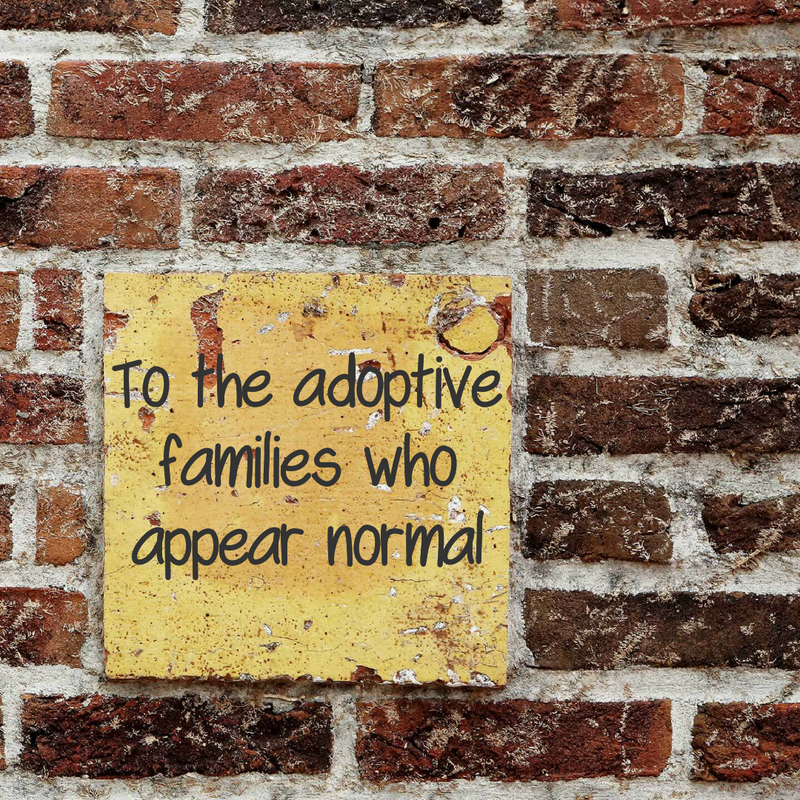 I got to thinking about adoptive families out there in this world and how their own internal normal in their home may differ so much from other families who have not walked the same road. The parents who run each bad behavior through an analysis of "Is this because of trauma or is this because he's a toddler?" The mom making sure therapy options for her young daughter jive with her adoption assistance plan. The mama calmly clasping little hands in hers as her child intentionally and violently scratches her. The parents packing up toys and snacks for their annual visit with their kids' first parents. The dad hurrying across the hall to do his best to calm a night terror. The mom seeking counseling for herself to help her face her children's challenges with grace and resolve instead of rage and surrender. The parent managing a plethora of psychotropic medications for their child to combat the effects of prenatal drugs. The sweet family who prays for their kids' birth mom every night. The aunts or uncles or extended family who struggle to bond with kids suddenly plopped into their lives. The child marking milestones...more days in this home than elsewhere, more days adopted and stable than floating from home to home. To the adoptive families that may appear normal but feel anything but... I have walked this road, the one that looks easy enough at first glance but ends up having pot holes and bumps and erosion and a few locked gates to navigate that other people may not see or understand. Dear families, persevere. Persevere in loving your children, in winding your way down that tricky road, in finding your new normal, in embracing it. I see you. I understand you. I am you. Of course I'm not going to go into details on the ole public blog here, but we had a little spike of drama concerning our kids' first mom a while back and it stirred up a storm of emotions in me, the second mom, that were new and weird and selfish and normal all at the same time. You see, we have an open adoption agreement with her (more on that at some point via a guest post from the hubs) so she is by no means gone forever from our life or our kids' lives, even though her parental rights have been terminated and our adoption is finalized. Most days we rock along in our normal routine, she'll come up in conversation with the kids here and there..."You know who gave you that shirt? Your first mommy did"... and they'll kind of look off to the side and nod a bit like they are seeing a shadow of a memory that they are trying really really hard to bring into focus. And then some things happen that bring all the past hurt, drama, questions and pain crashing into focus. Suddenly we find ourselves swirling with a hurricane of emotions that leave us simultaneously fighting waves of selfishness while stepping out of work for a moment to get tears of sorrow and compassion under control. Somewhere in that hurricane, I confessed to my husband...sometimes I wish I was their only mama... Sometimes I wish we didn't have to field the challenges of an open adoption. Sometimes I wish we didn't have to be the front line defense, to take the first bullets to the chest in order to appropriately shield our precious kids from the intense hurt that lies in their history. I quickly acknowledged how utterly selfish that is. He quickly validated my feelings. I noted that I'll just have to do my best to reconcile the occasional spikes of motherhood identity confusion with our otherwise very normal life as parents. He noted that this is an aspect of this whole situation unique to me, as the second mama, that he does not have to deal with in his heart, as the only daddy they've ever really known or will know. I used up a decent percentage of a box of kleenex, wishing my cubicle had a door to close. He asked an understanding coworker to cover his task while he walked around the block. And we went about our life. Because...this is our life. We have an open adoption and all the challenges that entails. I am the second mama, and in Baby's case the third mama, and I have all the emotions that entails. The confusion, the selfishness, the compassion, the joy and the fierce love I have for these kids. ...which lead us to find this online article from ABC News, which made us say WTF, except with the actual words instead of the acronym letters. It made me wish we could somehow go back on the decision that is very right for our family at this time, tell CPS "just kidding" and open our home back up. Texas doesn't have enough foster homes and we just closed ours. 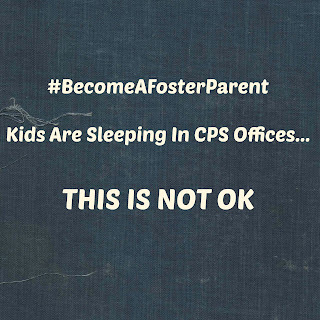 I texted with one of my foster friends, Kaley, about it, about the article, about our desire to throw open our doors and our arms and our hearts and welcome every kid from every county in our state, especially if the only option for some is to sleep in CPS offices after just being yanked from their homes. My friend said this: "I want to be able to do so much more than I'm able to do. Being a human with limitations doesn't jive well with my heart for helping." Another foster friend of mine, Elizabeth, once said to me "My heart is bigger than my house." Here's something I have discovered about foster parents: When they commit, they commit big time. All in. All the time. Give me all the kids, oh wait, I don't have enough house and only two arms. I already have three adopted babies, and because of that a severe dependency on coffee, wrecked knees, a wrecked house and yet my heart still wants to holler in the general direction of Texas as a whole: How can I help more?!? My foster friend, Kaley, that I mentioned above? She's a single foster (now adoptive) mom. She decided to jump into the trenches of this great need on her own as a single foster parent. She's got a great support system of friends and family, but how much guts does that require to take on foster care as a single adult? She adopted her precious son the week before we adopted our three kids. She could say she did her time, made her mark, and get out of dodge, but no, she is up for the challenge, is staying licensed and wants to continue to foster. My foster friend, Elizabeth, that I mentioned above? She and her husband are fostering two young sisters in their two bedroom house and she has to tearfully turn down calls for more placements of children because her heart has the space but her house does not. She and I have joked on several occasions about how Texas needs some villages/towns/compounds full of foster families that can support each other, cheer each other on and, most of all, provide a ton of homes for kids in need. Where are more people like this? My husband shared that ABC News article above on his Facebook the other day with his own plea to anyone, anywhere, who has any bit of pull toward foster care, to please contact me or him for more information about how to get started. He came home that evening and said "Nobody responded to my post." It wasn't with an air of dejection or disappointment. No, it was sadly with an air of "I figured as much." People will praise foster parents and expound upon their worth and necessity in society all day every day. (I can't tell you how many times I've heard variations of "You're doing such a great thing" and "Y'all are incredible". No. Hush. We are two people with a house and some energy and we said yes to something.) But turn the conversation to "you could do it too" and folks get real full of reasons why not. And I get it. 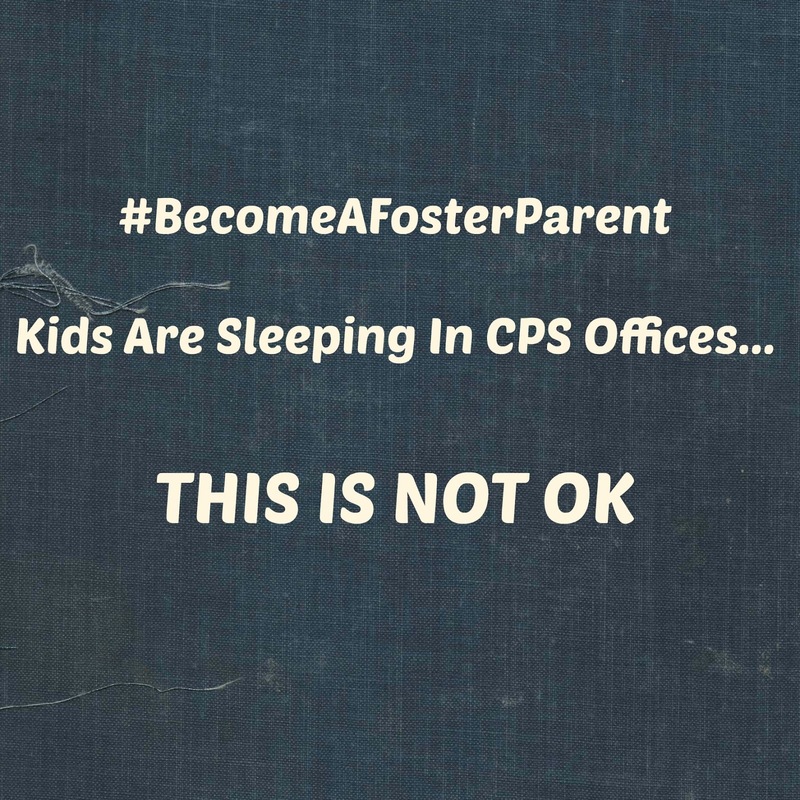 Not everyone can be foster parents. But a whole lot more people could than think they can. 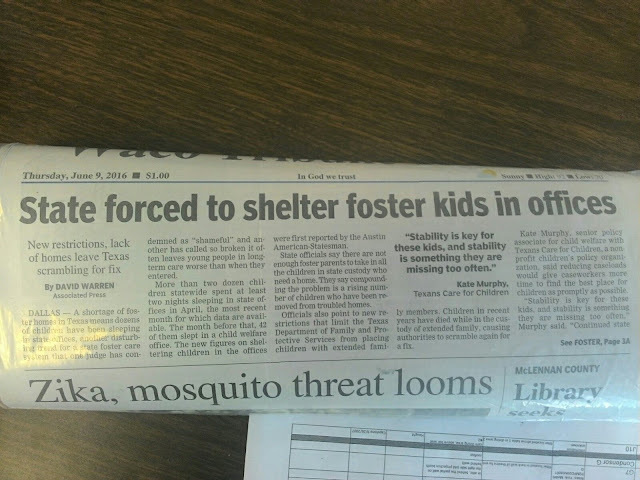 So how do we get them to catch the foster care bug? God? Hashtags? Angsty, dramatic blog posts? I wrote this post two years ago about why foster care is worth it and I stand by every word in it. It is worth it and it is greatly needed, in any county and any state. If you have any inkling whatsoever to know more, to try to start the process, to figure out how to foster and what it involves, please contact me. Please. Leave a comment here or message me via the contact form, Instagram link or Facebook link, all down the right hand side of my blog (doesn't show in mobile version, scroll to the bottom of the page and click 'view web version') and I would be over the moon to talk foster care with you, to pray for you, to pep talk you, to google resources in your area for you, to get you over the hesitation hump and into action mode. My husband's Facebook post got no bites. I'm hoping this one will at least get some nibbles. I just turned 29 in January. So math says that five and a half years hence, I will turn 35 in January of 2022. 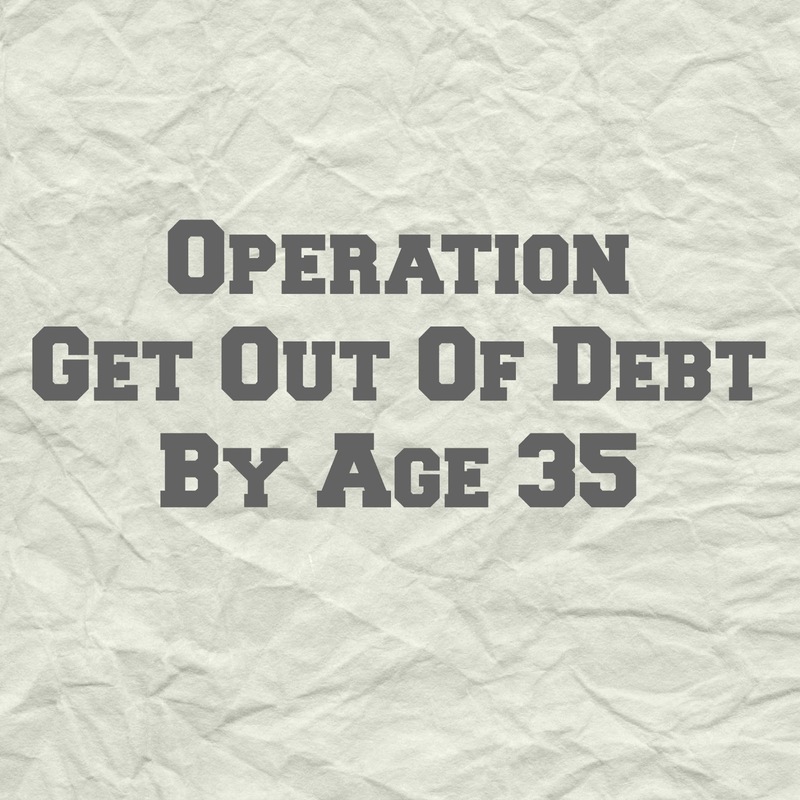 We intend to be out of debt by the time I turn 35. Yes, we realize that sounds absurd. Our cars are long ago paid off or bought with cash in the first place. Our credit cards are not so long ago paid off. That just leaves student loans and mortgage. Let me say that our old house, purchased in 2009 if that says anything, was reeeeal cheap compared to a lot of mortgages out there. Only five digits, to be frank. At this point, we actually have more student loan debt than we do mortgage debt. Gross. So my comment above of "yes, including the mortgage" should maybe instead be "yes, including the mountain of student loans." But at any rate, we are not dealing with an insane amount of debt here overall, hence why this plan feels so doable. My hubby graduates from seminary this December and will once again become a regular wage earning individual. For the past year and a half, we have basically lived on my income alone, plus some part time work of his, and it has been completely sufficient. His pending increase in wages will be a windfall of dollars available to pay off debt that we have not otherwise been used to. If you adopt a sibling group from CPS foster care in Texas (or a single older child or a single special needs child), you are eligible for adoption assistance. This includes staying on Medicaid for health insurance, free state college tuition, and a monthly stipend amount from the state which for our situation (it can vary) amounted to the max available of $400 per month per child. Yeah. Whoa. So we don't have to pay for health insurance for three kids or save for college tuition for three kids, and in the meantime, we get $400 a month times three kids. A smidge weird, not gonna lie, to have the state of Texas helping pay to raise our very own kids, but it sure helps. So, now that our adoption is finalized and our regular foster care reimbursement and daycare subsidy went away, we still have assistance to help with kid costs. We're talking about almost six years to accomplish this ridiculous yet possible plan. Gonna be a few raises in there. More dollars for more debt pay down. We have always been a big fan of people living within their means. It just makes sense for your lifestyle to not get bigger than its britches. So instead of escalating our spending as we have these increases in income mentioned above, we're gonna stay right where we're at, with used cars, an old house, few vacations, hodge podge clothing and basic/few kid toys. We live a full, happy, unique life already and don't need fancy stuff to complete it. I don't like debt. Who does? I think most people would love to blast their debt and have it out of their lives but unfortunately these days it is just so common for debt to remain a regular part of our lives. It's just a fact of life for most middle class people...there will always be a car payment...there will always be a mortgage payment...there will always be a credit card payment... But it doesn't have to be that way. Life doesn't have to be lived with debt. Maybe it's a mindset issue, a motivation issue, a planning issue, a responsibility issue, an expectation issue, an appearance issue. There will be a different culprits for different households, but debt does not have to be the norm. We decided long ago that debt would not be our norm. 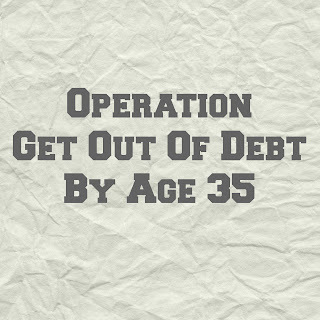 Fun fact: my original plan was to be debt free by the time I turned 30 and we were gonna do it, but then my hubby went back to school and three babies showed up at our doorstep so that got a bit derailed. But now we are on task for the next half decade. When I was a little kid, in the early 1990s, I remember one day my dad came home from work with a funny look on his face and something stuffed down the front of his shirt. He danced around and cutely made mom dig it out. It was a piece of paper, crumpled by that point. Mom read it, let out a squeal, jumped up and down and hugged dad like crazy while we kids stood around wondering what the heck was going on. They had paid off their mortgage. On the big house they had built on 30 acres less than ten years prior. For some reason that moment of absolute joy between my parents lodged in my 8-ish year old memory and never went away. I asked my dad about this the other day, to make sure I had my memory right. Of course he remembered it too. I told him "Good job on that. Good example" and told him we were ramping ourselves up for our plan to be debt free by the time I turn 35. He said "Well thanks. And I'm excited about your plan. You can not imagine the freedom and peace and comfort and other opportunities you can experience and enjoy when you are out of debt. Go Futrals!" So we are hereby starting a family tradition of kicking debt out of our lives as soon as we possibly can and keeping it that way. We've got our spreadsheets and our plan and, most important, our resolve.